← What does the Joint Local Plan mean for us? 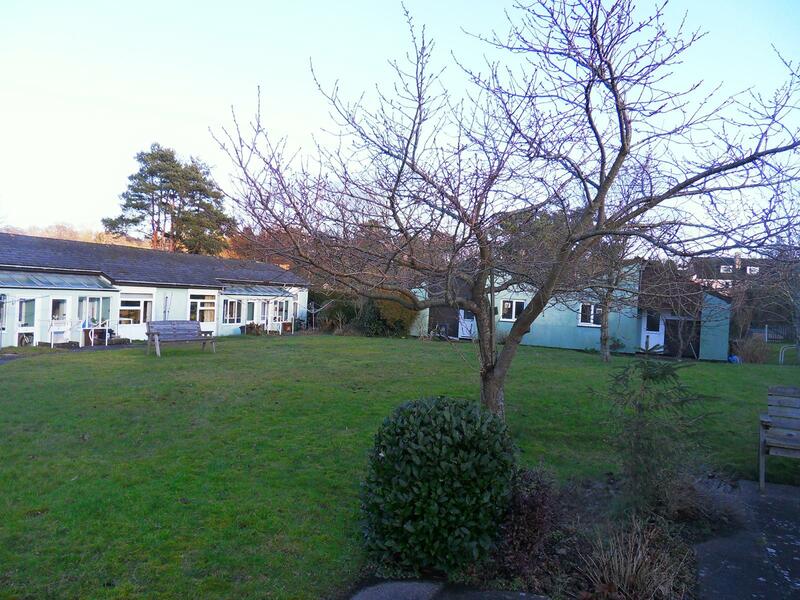 Since 2015, the community of Dartington village have been objecting strongly to South Devon Rural Housing Association’s (SDHRA) plans to redevelop Brimhay- a community of 18 small bungalows around a green in our rural village of Dartington. We are thrilled that the four breweries in our community have come out in support of our alternative scheme (more to follow on that). We thought this was a good opportunity to bring together the various arguments in support for our alternative scheme, and why we have given so much of our time towards making it a reality. The community’s redesign for the site has consulted extensively with the community, and with Brimhay residents and with Dartington village. It dealt with all the community’s objections to SDRHA’s scheme, and then asked every household in Dartington what they thought. 202 preferred our scheme, 2 preferred SDRHA’s. Conversely, SDHRA held one consultation attended by 7 people since when they have refused to listen to anyone. SDHRA claim “our door is always open”, but this has not been the community’s experience. SDHRA were invited for months to attend a meeting of Dartington Parish Council, and when they did turn up they kept their plans folded. Our alternative scheme has been funded by events, such as our curry night, attended by hundreds of people, and by donations and community fundraising. Both schemes offer to build 12 social homes. In SDHRA’s scheme, those are squeezed into a 3 storey block with no lifts, funded by 12 very dull open market homes. In ours the 12 social homes are funded by 10 open market homes, but very beautiful homes that take full advantage of this beautiful site, preserve the green spaces and therefore will attract a higher value. SDRHA’s scheme is a form of social apartheid, in contradiction of government guidance it puts the social tenants into blocks of flats and the open market houses in detached houses. In the community redesign, it would not be possible for a visitor to be able to tell which were social homes and which were private. 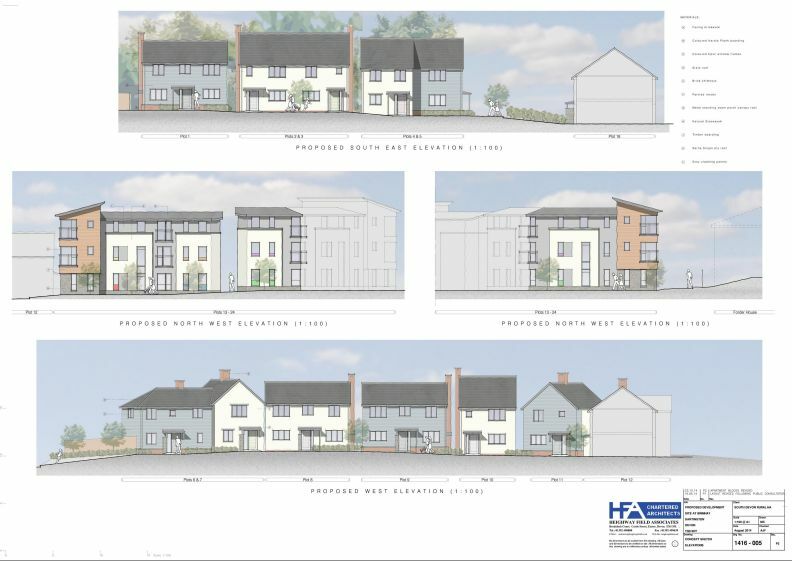 The community’s scheme will be beautiful – the homes will be built using hemp and timber, designed by a very sought-after designer who has won awards nationally. SDRHA’s scheme is rendered concrete block, completely out of keeping with the local vernacular. With new developments being built in Dartington, any homes built in competition to those need to be more beautiful, not less. Designed by Leonard Elmhirst, cofounder of Dartington Hall Trust, Brimhay’s bungalows were built around a shared green and close to a nursery school to provide homes for local elderly people. The design encouraged people to walk through it to access the village shops, main road, school and other residential areas, so it soon became an important focus for the village and offers a well used traffic free route for locals, including children, who can avoid busy narrow roads to school and nursery. 2. Because SDRHA’s plans will lose all this. 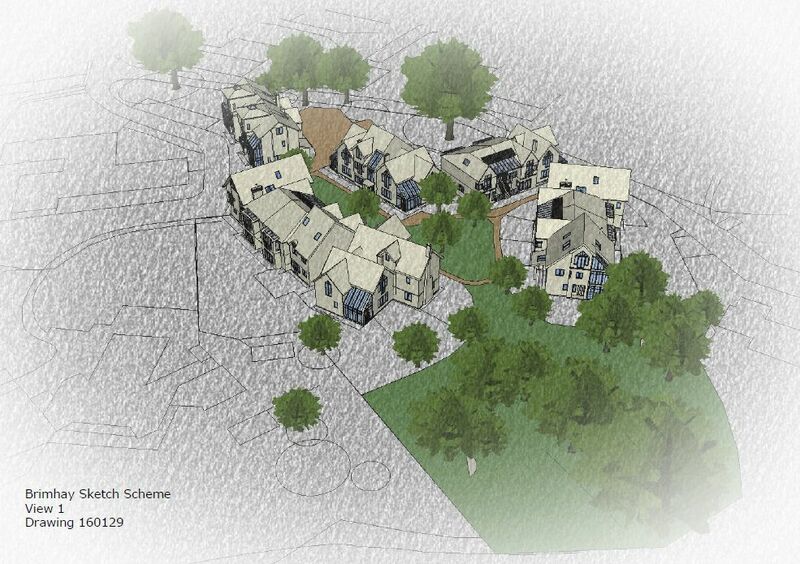 In 2015, SDRHA proposed redeveloping not only the bungalows, but building over the gardens, central green and a wooded slope leading down to the stream, to cram 12 social flats- in a 3 storey block without a lift, 8 assisted living units in another 3 storey block and 12 detached market houses with gardens on the majority of the site, to fund the flats. Brimhay’s central green would become a hammerhead of road around which the dense urban style flats and houses would be built. Pedestrians would have to cross this road- to service the 100 people that could live on the small site and there would be no open space left for walkers, children and the elderly residents of adjacent Forder Lane House- for whom Brimhay Green is their only accessible green space. 3. Brimhay’s tenants will be marginalised into flats. That’s unfair. None of the current tenants wish to be moved into a flat. Although the bungalows may be dated, tenants will lose their gardens, open space and community- their contact with neighbours. Some have pets. Their land will be sold off as they are sold out into flats with no lift and a communal garden space the size of 1 car park space for up to 24 people. Building flats for social tenants next to detached houses for those who can afford them is outdated and discriminatory. It’s no way to design an inclusive community. 4. 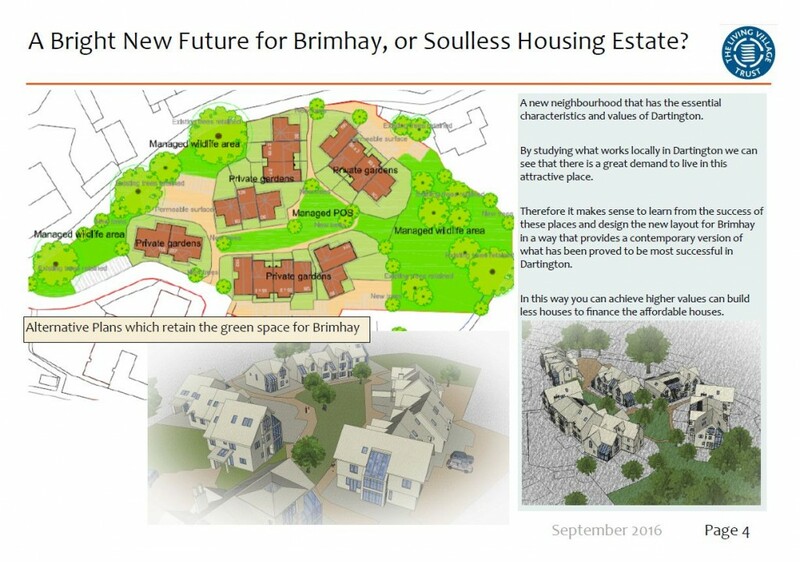 What is built at Brimhay could determine other new builds in Dartington. A popular village, threatened with up to 500 new houses in the joint Local Plan, Local people already fear the loss of Dartington’s rural character. By allowing an urban density and style at Brimhay, a planning precedent could be set for similar developments all over the parish. 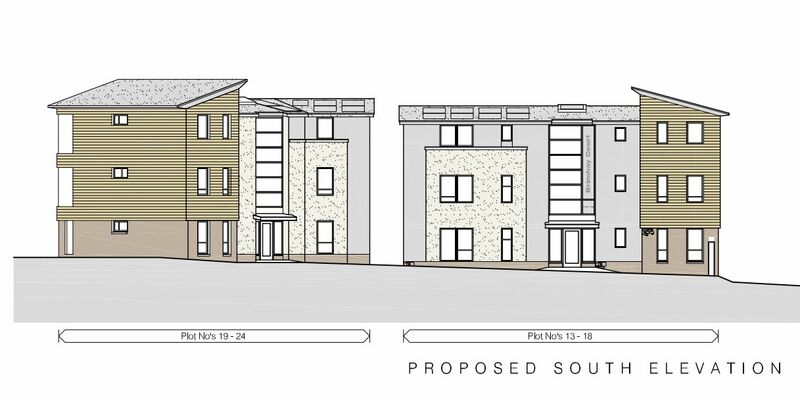 Clone houses, concrete blocks and building around the car instead of green space goes against all the aspirations we might hope for in any new developments. The dense unimaginative design has appalled hundreds in Dartington and beyond. 5. This scheme damages wildlife and habitats. Brimhay valley is part of a vital wildlife corridor. It is the habitat of dormice and at least 5 species of bats-including Greater Horseshoe bats that fly and forage over the site. All are supposedly protected by European and UK wildlife legislation, yet this scheme threatens to obliterate the wild valley, clear 93% of the trees and threatens to disorientate foraging bats by the increase in lighting. 6. There was hardly any consultation by SDRHA. Yet over 200 local people- that’s 23% of the total parish population- wrote to South Hams District Council once or more to object strongly. Our Parish Council objected, – in fact only 1 person wrote in support of the SDRHA scheme- yet still SHDC approved the planning application in July 2015. 7. We are SWIMBY’s not NIMBY’s! Instead of simply objecting, local people in Dartington gave an unprecedented response to SDRHA’s scheme- we offered something much better! Thanks to the Living Village Trust’s Bob Tomlinson; Daily Telegraph award winning sustainable designer, we looked at each of the issues that people had objected to in SDRHA’s scheme and turned each one into a solution. Bob designed a beautiful high spec residential community of homes, focussed around people- not the car. With communal gardens and green spaces and leaving the wild valley wild- as a community nature reserve. Tomlinson’s unique houses are timber framed, exceptionally insulated, and warmed by south facing windows- eco friendly and a real saving for those on low budgets. The houses and specialist housing takes its cue from local vernacular designs; roof heights vary, there are sunlit places to sit, chat and move through the community, cars are parked at the edge and safe traffic free paths wend between gardens. Smaller units blend in with larger family open market houses; forming one seamless community. It’s all inspired by his award winning development at the Wintles in Shropshire, and so keen are people to live in one of Bob’s unique homes, they are often sold off plan- a sure way to finance good social homes, which would also be kept in trust as social homes forever for the village. When offered a choice of the two schemes, over 200 locals wrote in to SHDC asking for Tomlinson’s scheme to be built. Only 2 said that they preferred SDRHA’s. With all the designs given pro bono by Bob and many volunteer hours to prepare it, the scheme was prepared for planning and Dartington Parish Council applied for planning permission representing the groundswell of community support. We asked some experts for their views- and received support from Jonathon Porritt, Lord Matthew Taylor MP, Molly Scott Cato MEP and Channel 4 Grand Designs’ Kevin McCloud. We offered the design to SDRHA free of charge- and offered to build it and donate the social homes back for them to run. To date they have refused to engage with the community. Despite all this, in July 2015, SHDC approved SDRHA’s scheme. Appalled, a Brimhay tenant took the council to a judicial review, with massive support from the community- and won the case in the High courts of Justice in July 2016. Shockingly, councillors have approved exactly the same scheme when resubmitted by SDRHA this summer and as contractors with brush cutters and chainsaws moved in to clear the valley days after permission was given, we have helped the same applicant start another Judicial Review. What we’d rather do now is to sit down and talk to South Hams District Council and SDRHA, about a better way forward- preferably over a beer! It’s this indomitable positivity, creativity and love for Brimhay’s people, wildlife and green spaces that has inspired four local brewers to help us do just that! We’re blown away to have a beer to celebrate Brimhay and all the great possibilities for its future and delighted that every time someone enjoys a Brimhay Pale they’ll also be contributing to our campaign. Development doesn’t have to be against people and places- development done with communities can be a real win; win. And if we can inspire other communities to take developments into their own hands, then we’re delighted. 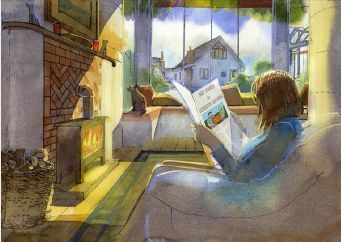 Sustainable houses that are low carbon, people and wildlife friendly? We’ll drink to that. Cheers.